I’m so excited to share with you my favourite homeschool sale of the year. Now, I’m not kidding when I say that. I’ve been homeschooling for 11+ years and have a large family. I understand that as fun as homeschooling is the costs can sure add up. That’s one of the reasons I truly love the Build Your Bundle sale so much! In a hurry? Click here to see the huge savings right now! I look forward to this sale because each year I buy a lot of our own homeschool curriculum and resources through this sale. I LOVE saving up to 95% off my curriculum, don’t you? 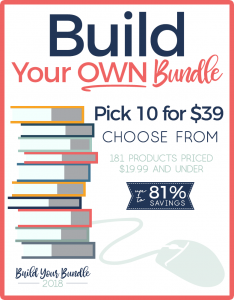 The 5th Annual Build Your Bundle Sale is the largest one yet. 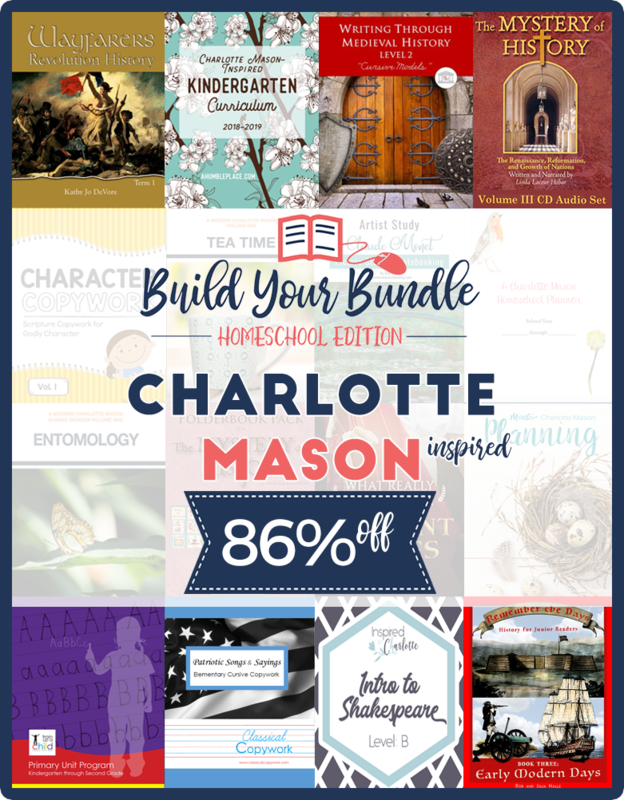 20 individual bundles that include homeschooling (by grade levels/themes), homemaking, parenting, character building, and more. Over 250 products & 128 authors/publishers. Bigger bundles and lower prices. 17 courses/memberships priced 50%-70% off retail (high school science, homeschool conventions/conferences, music courses, full curriculum, and more!). You only have one week to save - the sale ends 5/14/18. Click here to shop now! I have another surprise for you. This year 2 of my products are in the Build Your Bundle sale! With fun unit studies, paper dolls, cookbooks, and more – your kids will be so delighted with this bundle, priced at just $10 – 94% off! Click here to see everything that’s included in the Brothers and Sisters bundle! Looking for a fun and easy way to do art appreciation this year? You will love my Claude Monet Picture Study & Notebooking study included in the Charlotte Mason Bundle. Step by step directions on how to start doing a family picture study. 23 full-page Monet’s paintings.1 summary page for each painting listing its name, date of creation, and art medium, and starter questions. 99 notebooking pages including lined and primary lined. Resources list for books, documentaries and online videos that can extend your studies. But that’s far from everything available! There are curriculum bundles for all ages and styles of learning. Click here to find what’s right for you. Would you rather pick & choose what YOU want to purchase? If so, then you can Build Your OWN Bundles! I did this last year myself. Although I bought many pre-made bundles I also enjoyed creating my own bundles so I could buy just the items I really wanted. There are 254 products priced up to $175 that you can choose from. Back by popular demand is the NO PRICE CAP bundle! Don't forget that if you buy 2 Build Your OWN Bundles you will get 1 for FREE! Purchase 3 Premium Bundles of Five and get the best savings! Total potential value: $1,334 for just $78.00! You can save up to 94% with the Buy 2 Get 1 FREE deal when you Build Your Own Premium Bundles! This year you will find more courses/memberships available than ever before! You will find 3 complete high school credit classes in Science for only $39.50 each - a savings of 50%! Back this year by popular demand is the at 50% off as well. Take a look below to see how you can learn all about working from home as a Virtual Assistant. Have you ever wanted to attend Teach Them Diligently? Now you can! You can also get access to Homeschool Summits and the Parenting Teens Summit workshops - all for 50% off! This year you will also find an Introductory German Course, Skill Trek Membership, a full apologetics course (1 high school credit), 3 music oriented memberships, a wardrobe course for moms (say goodbye to frumpy! ), and a biblical parenting course. I know it can sometimes feel overwhelming when you see so many things offered. But taking advantage of a sale like this can save you hundreds, if not thousands of dollars on curriculum and home resources. I know it sure has been a blessing to my family over the years! To help make your planning process easier here are 2 helpful resources. You can download a handy buyers guide that has all of the products valued under $19.99 organized by category. Using that along with this printable shopping list makes planning your curriculum order much easier! Do you want to know my best tip to maximize your savings? If you place your orders just right using the Buy 2, Get 1 free deal you can buy ALL the curriculum valued over $5k for just $370! I can't wait to get shopping today. What is your favourite product in the bundle?